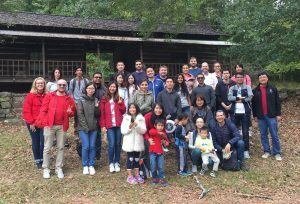 On Oct. 20, international students and ISSS staff went to a Fall Cultural Retreat which was held at Tannehill Ironworks Historical State Park. The 40 students and staff who represented The University of Alabama at the retreat enjoyed visiting the Iron & Steel Museum of Alabama, a pioneer farm, hiking to the old ironworks facilities, seeing artists make their own hand crafts, and visiting “Trade Days” which is where people sell local food, handmade items, and antiques. Although there was a bit of rain throughout the day, it didn’t stop our students from having fun and exploring the state park grounds. International students were able to visit the Old Country store, see the Halloween decorations on display, and play games together near the campsite. Approximately 150 international students attended from various universities around Alabama including University of West Alabama, Samford University, Gadsden State Community College, and Jefferson State Community College. A Lebanese style lunch was provided by Regions bank, and The University of Alabama provided the snacks for the retreat. This truly was a cultural experience as students were able to learn about local Alabama culture, as well as make new friends from other countries! International Student and Scholar Services (ISSS) is a part of the Capstone International Center and is an integral part of an international student’s experience at The University of Alabama. ISSS helps F-1 and J-1 students maintain their visa status while studying at UA. The mission of International Student and Scholar Services is to provide essential services and innovative programs for The University of Alabama international students, scholars and their families to enable them to achieve their educational, professional and social goals. ISSS seeks to foster diversity and strengthen inter-cultural relationships throughout the UA campus and community. It is our commitment to promote understanding and respect for the world’s many cultures. We do that through offering weekly activities such as International Spouse Group which meets from 10-11:30am every Wednesday, and International Coffee Hour which happens from 11:30am-1:00pm every Friday during the fall and spring semesters. ISSS also sponsors special events such as the Fall Cultural Retreat for our international students. If you want to keep up to date with all the activities ISSS is hosting, follow us on Facebook @UAInternationalServices.